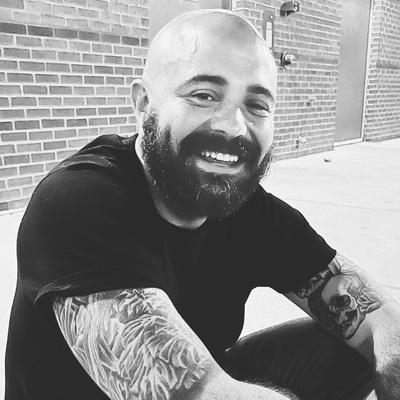 I am a web developer / Senior Manager, Development at Domo. I started off my career building websites for dental practices and have since had the pleasure of working with Fortune 100 and 500 companies from the mining industry to show business. and many other internationally recognized brands. For more information, take a look at my profile on LinkedIn. Two years after launching the original site, we decided it was time for an update. My personal goals in this version were to create a site that would deliver more leads, have an easier to use interface, better mobile experience (responsive design) and internationalization support. 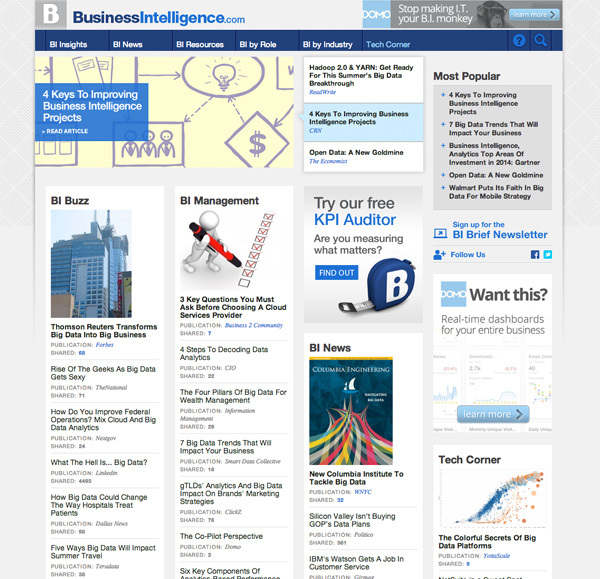 I am very proud of the team I was able to work with on this project and the site we created. 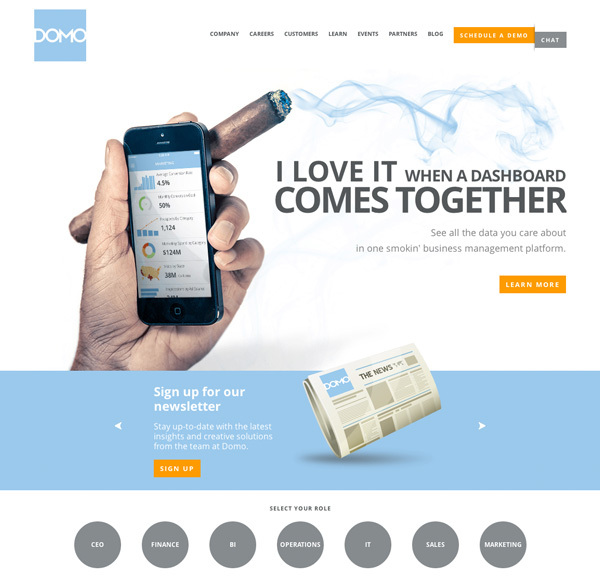 The initial build of this site was done by me while working at Domo. I spent a lot of time creating custom post types and utilizing the Advanced Custom Fields plugin to give the administrators complete control over all the components of the site. One feature I wrote that I really enjoyed would gather data for each of the articles and check popular social sites for the number of times it was shared and return a cumulative score. 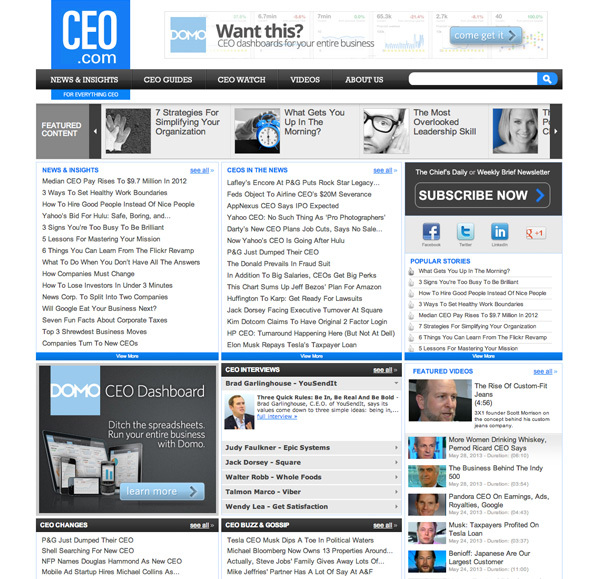 This would allow the user to gauge the popularity of an article. I am also pleased with the performance of the site. I ended up rolling my own caching system that, unlike most Wordpress cache plugins, bypasses the init process making it even faster and less memory intensive. To date this is the Wordpress build I am most proud of. 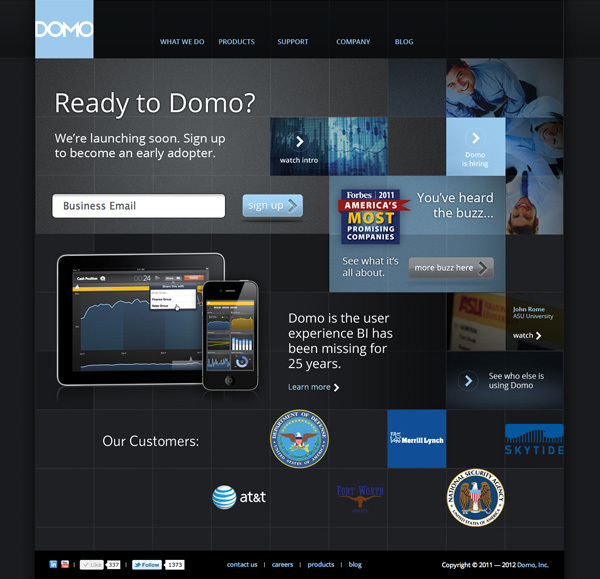 While working at Domo I had the opportunity to help launch this site. My role at the time was to help build out new features and get the site ready to go live. When I first came to the project it would take at times over 20s to load! After doing a extensive audit of the codebase I found many ways we could increase speed and performance. Over the course of two weeks I worked on limiting requests, caching (everything we could), optimizing queries and implemented every trick in the book. To this day the site consistently takes about 1s to load (post cache of course)! The majority of this website was built in about 6 of the craziest days of my life. I could have never done it without the help of my boys Merrick and Kenneth. One thing that we came up with that I felt was very clever was to use Expression Engine as our content management system but rather than using their templating engine we use it only for data entry. We then built a restful api to interact with our database and pull the results in JSON format. This allowed us to build our site using Kohana and render our own templates using Mustache.js. This gave us much greater control and flexibility than if we had glued ourselves to the Expression Engine framework. Overall, I am very happy with what we were able to accomplish is such a short amount of time. This was the last project I worked on during my time at Riser. We were tasked with the front-end development and integration of Bunchball's gamification technology. The front-end piece needed to be very flexible. To accomplish that I implemented a lot of the lessons I learned about OOCSS in the book SMACSS. The gamification element of the site allowed registered users to accumulate points by interacting with website elements (videos, photos, reading, polls, quizzes etc.). Users may then redeem their points for free things. 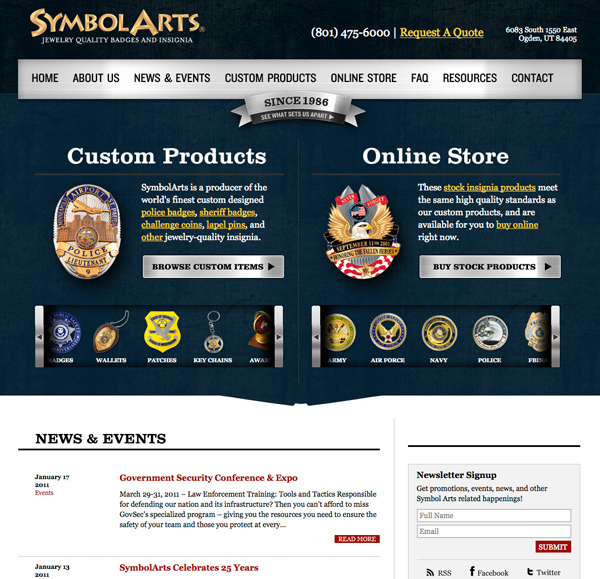 SymbolArts is a producer of the world's finest custom designed police badges, sheriff badges, challenge coins, lapel pins, and other jewelry-quality insignia. Client can edit everything on site without knowing code. This web application was built for National Geographic Kids. 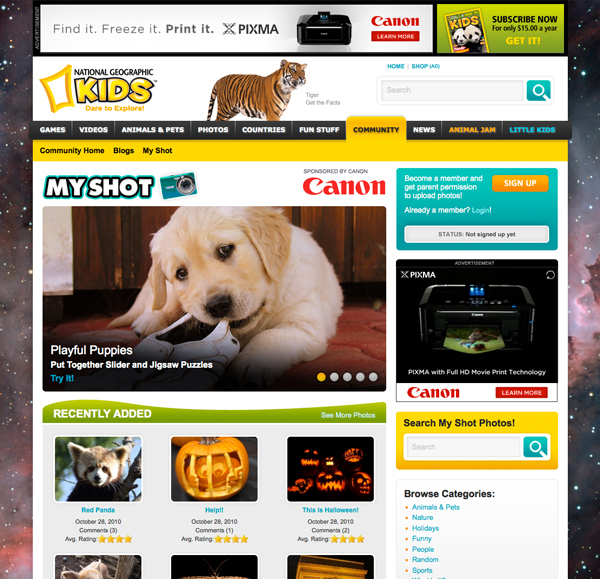 It is a photo sharing website tailored to kids, and is fully moderated by National Geographic producers. Full Community — rating, comments, and profiles. Photo cropping resizing and handling. Account approved by guardian email address. Tags, categories, and metric based browsing. Robust, Object Oriented HMVC Codebase. I really love the look of this site. It was done for ABC Domestic Television. The site didn't allow for any server side languages such as PHP so we built it using a really cool Ruby gem called "Nanoc" that allowed us to build it dynamically and then compile the final project. 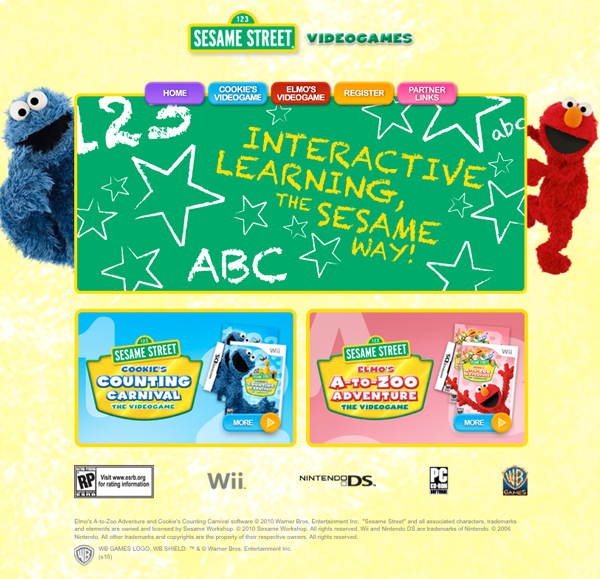 This website was done to feature & promote two new Sesame Street videogames (Cookie's Counting Carnival & Elmo's A-to-Z Adventure) that will be released October 2010 for the Wii, Nintendo DS & PC. 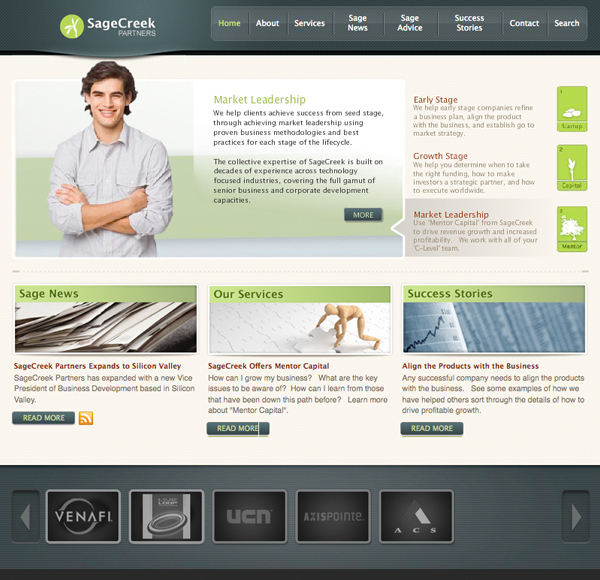 On this project I played a huge role in the build out of the comps (web designs). Since it doesn't run on a CMS of any kind, that really is all there was to it. It was a very straight forward project and a nice one to be involved in. 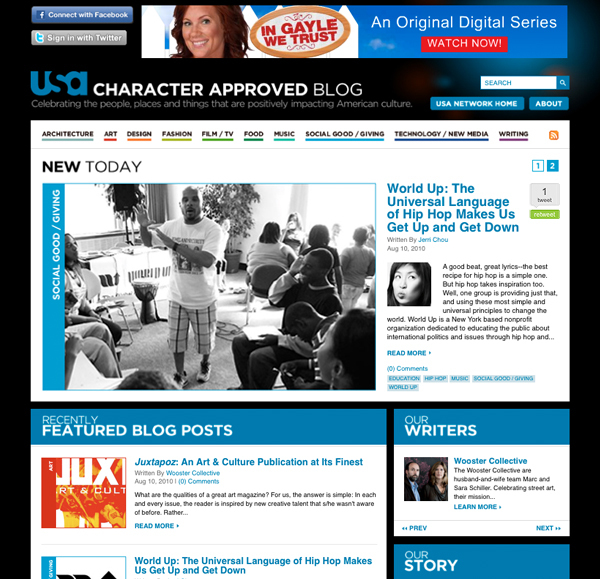 This project was for the USA Network and was a real fun project to be a part of! All the designs were given to us and my job was to code out all the front end stuff and then put the site into Movable Type. Everything on this project went exactly as you dream it would. I consider it a big success. 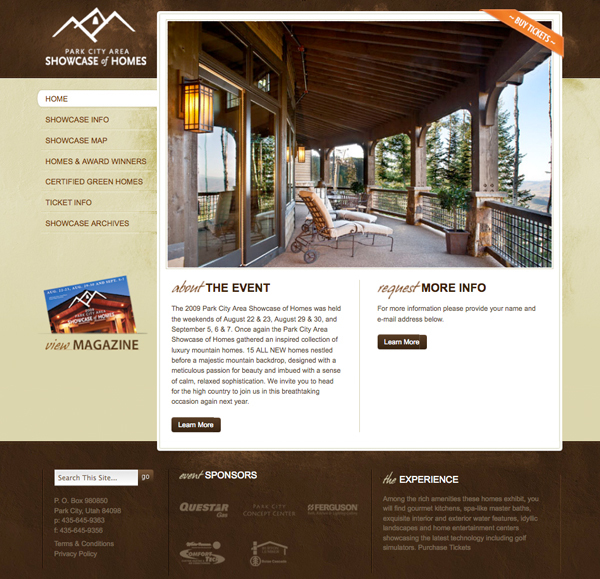 For this project I was in charge of the front end build and WordPress integration. I also built a couple of custom WordPress plugins to help manage their content. One of the plugins helped users submit content and allowed moderators to reject or schedule submissions to be upcoming posts. Submitted photos could be re-sized, cropped and watermarked. The second plugin gave them the ability to schedule background images (with sunrise and sunset dates) and make them linkable for advertising purposes. Due to the extremely high traffic this site receives it added an extra bit of spice that made this one fun project to work on. 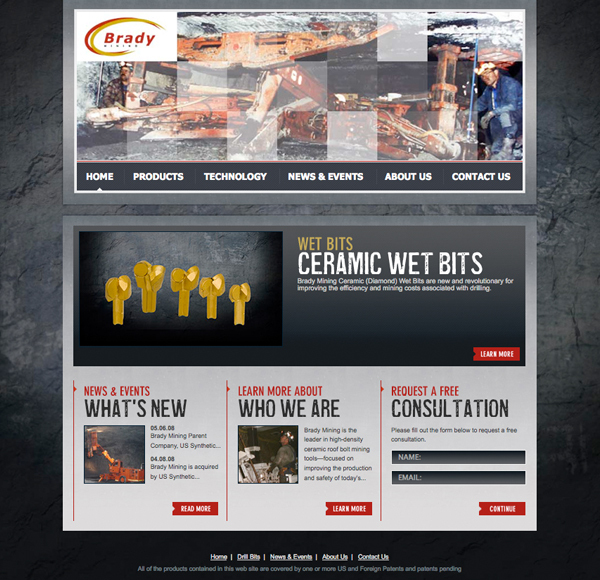 For this project I was hired only to do the front end build (xhtml/css). 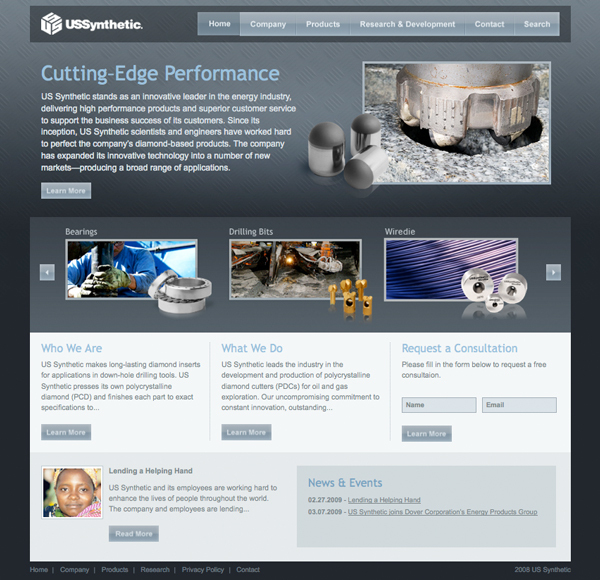 This is one site I am particularly proud of because of the amount of detail that is involved in the design. All the textures and layers add a level of difficulty that I absolutely love to tackle to see if I can make them "pixel perfect". This is by far one of the most challenging projects I've been a part of. 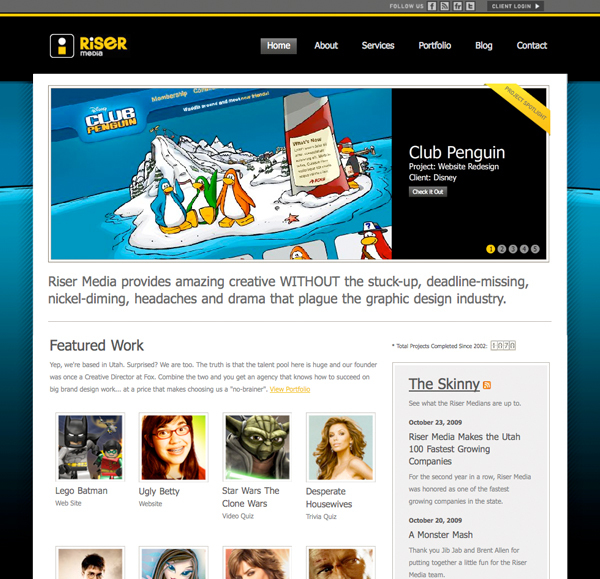 Together with the team at Riser I helped to build out this website. There are so many different aspects of this project I had "my hands in" that truthfully I don't even know where to begin. The project was tough but when all is said and done I feel it was a success and a huge improvement to their web presence. This is one project I was really excited to be a part of. 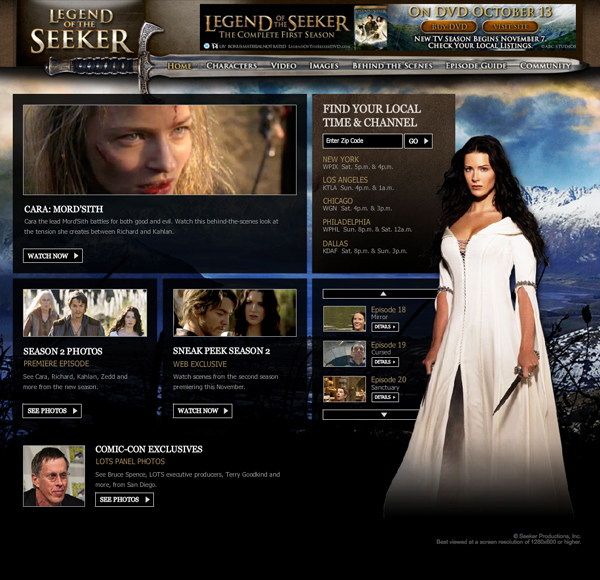 The TV show Legend of the Seeker hired us at Riser to completely re-build their site (design, code, the works). It was weird having to program everything in straight HTML again since I hadn't done that in years but the end, in my opinion, result still came out amazing. What a great project and client to work with. This was one of those perfect projects that every freelancer hopes for. 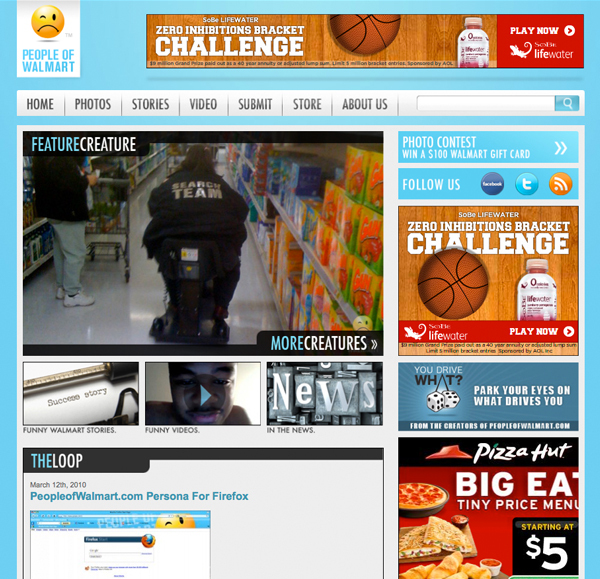 I was hired to do the front end build (HTML/CSS) and WordPress integration. Everything went incredibly smooth and was completed in less than a week. I am very happy I was a part of this project. I was contacted in July of 2009 to convert the popular European soccer/football site Kickette from Expression Engine to WordPress. Normally converting sites is pretty straightforward but this particular site had over 10,000+ posts. That's a lot of data to move! After getting the bulk of all the work done I then passed the project off to some other developers to finish up. All in all it was a good project. Kickette brands itself as the authority on soccer/football gossip, news and fashion. Written from a female perspective, Kickette is the first and largest dedicated site for female soccer fans. This is just another one of those projects you dream to get as a freelancer. I did the HTML/CSS build and WordPress integration. It went quickly and without any hiccups. Not to mention it is always fun working on stuff that looks good. US Synthetic hired us at Riser to rebuild all their sites (US Synthetic, Brady Mining, Suncrest Diamonds, Sundance Diamonds, USS Wire Die and US Bearings). I built out the HTML/CSS for all six of these sites and integrated them all into the same instance of Expression Engine so they could manage each site from the same location. It was a very fun project and the people at US Synthetic are just the easiest people to work with ever. The whole project was a major success. One of the six sites I was able to build out for US Synthetic. For more information about the whole project read the description under US Synthetic. When the company that I work for decided to change its name from Jandaco to Riser we completely rebuilt our website to match the new brand. Today this is still one of my top favorite sites I've worked on. I just love the look of it and how effective it is at transmitting our company's image. 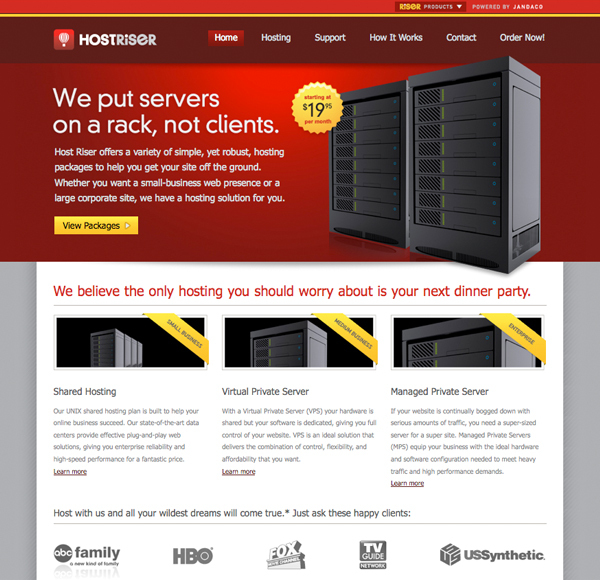 This site was done for Riser and was built to provide information about our various hosting packages and allow people to sign up for them. I am extremely happy with how it turned out. 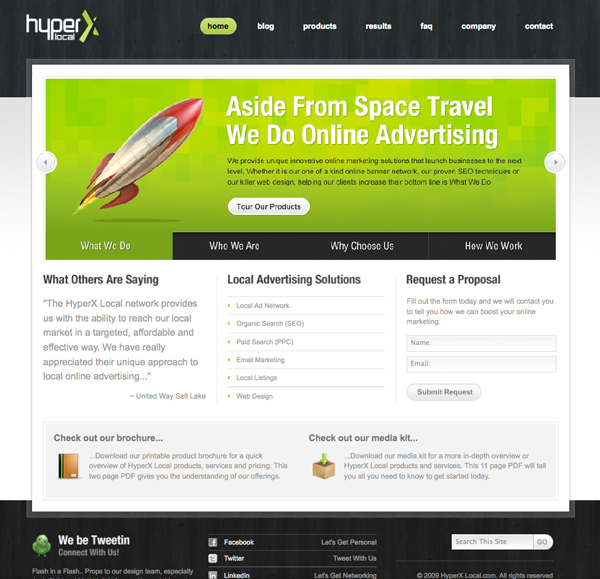 This site has been featured on lots of popular websites for its design. 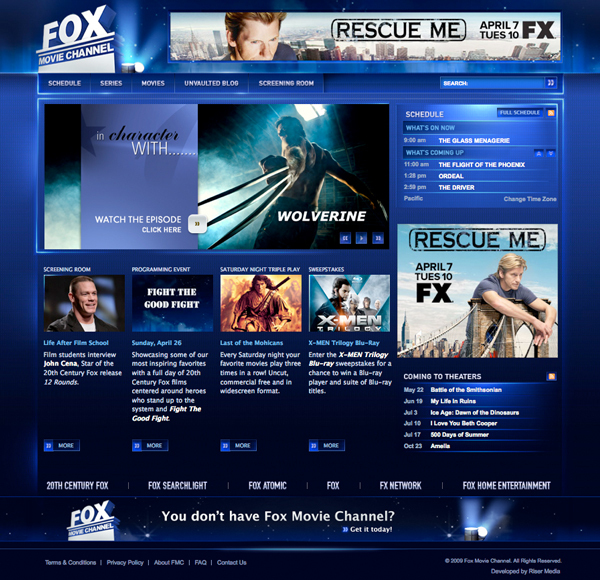 This site was done as a press kit for TV Guide to prepare people for their upcoming award season. It was a very basic site done in WordPress but it got the job done. This was the very first project I ever did in Movable Type. At first it worked great but due to scalability issues I ended up converting the site to WordPress. To this day I am very pleased with the way it turned out. I love the design and the custom plugin I built to manage their library files. The reason I like the plugin so much is because it was one of the first custom plugin's I built in WordPress and it still works great today. This project was done for HBOlab a.k.a. Runawaybox and was the first project I worked on at Riser. At the time HBOlab was a part of HBO but the company has since been purchased by Break Media. 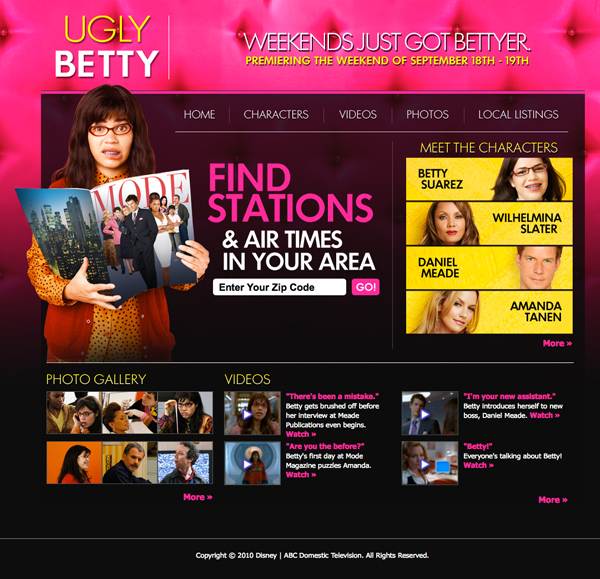 The site was made to host an internet tv series called Hooking Up. The concept was to take a bunch of YouTube "celebrities" and make a show with all of them in it. The site was only up a couple of months before HBO pulled the plug on this experiment. The easiest way to follow along. Recieve a digest of my latest content sent to your inbox. I promise to never share your email and will only send a maximum of one email a month—some month's nothing will be sent.